Businesses will need to assess how they support the iPhone in their enterprise IT strategy now that Apple has developed the iPhone 3G as a mobile platform for business users. Earlier this week, Apple chief executive office Steve Jobs said the phone has already been tested by large businesses through Apple's iPhone beta programme. The device provides functions required by enterprise IT such as support for the Cisco VPN for securely connecting the device to the corporate network Microsoft ActiveSync to share e-mail, calendar and contacts between the iPhone and Microsoft's Exchange Server and iPhone 2.0, a programming interface, which can be used to create mobile enterprise applications. "Thirty-five per cent of Fortune 500 companies have participated in the iPhone beta programme," Jobs said. The list includes four of the five big banks, five commercial banks, the top-five securities firms, six of the top airlines and eight of 10 top pharmaceutical companies. IT departments face the challenge of potentially supporting four mobile operating system platforms: Research in Motion's Blackberry Enterprise Server, Microsoft Windows Mobile 6.0, the Nokia/Symbian platform and now iPhone 2.0. IT directors will have to assess the security impact of putting the iPhone on the corporate network, if Apple is successful at making the iPhone an enterprise. 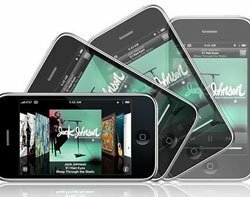 In spite of Apple's efforts to build in security into the iPhone, Tony Cripps, senior analyst at Ovum, warned that businesses should be wary of iTunes, an integral part of the iPhone 3G device. The iTunes music store is used by Apple to upgrade software on the iPhone, Cripps said. "IT directors will need to get assurances from Apple that any security risk on iTunes cannot be passed onto the corporate network."